Keep up to date with the latest news releases on the history and progress of the recommendations of the Katherine and Darwin Regions Flood Mitigation Advisory Committees. The Northern Territory Government is committed to assisting residents in flood-prone areas through a range of flood mitigation options recommended by the Darwin Region Flood Mitigation Advisory Committee. Recommendations range from improvements to policy and strategy, to structural mitigation works for flood prone areas in the Darwin region. Issues with flooding in the Darwin region are largely dependent on locality. Over the past few years, a number of areas have experienced riverine flooding or flooding due to storm water and trunk drainage issues. Flooding can occur in the Rapid Creek catchment when heavy rain combined with high tides causes floodwater to back up into the creek and flood low-lying properties. Updated flood modelling identified a number of structural flood mitigation measures and the Department of Infrastructure, Planning and logistics is building a detention basin to minimise the impact of flooding in the Rapid Creek catchment. installing backflow prevention devices to manage sewerage. A detention basin will be built on the corner of McMillans Road and Henry Wrigley Drive in Marrara to temporarily detain storm water flows from Anula, Moil and parts of Marrara. A contract to build the detention basin has been awarded to Sitzler and construction is expected to start in June 2018 with the bulk of the earthworks completed before the onset of the wet season. Residents and the general public will be kept updated on any impacts of the construction works and required traffic management on Henry Wrigley Drive and Abala Road as part of the project. An earthworks management plan has been developed in accordance with NT Environmental Protection Authority requirements after low levels of Per- and Polyfluoroalkyl Substances (PFAS) within soils were discovered onsite. However, the levels of PFAS detected are significantly below the Health Based Guidance Values for PFAS. The design of the basin seeks to retain as much native vegetation as possible, with land to be cleared for the perimeter embankment only, while the excavation for the basin floor is in the previously cleared part of the site. The design of the basin seeks to retain as much native vegetation as possible. Land will only be cleared for the perimeter of the embankment. When complete, the basin floor and embankment will be grassed to stabilise it against erosion and it will remain free draining, detaining water generally no longer than 24 hours after a large rainfall event. The basin is designed to fill from the inside out (see image above) to prevent water becoming trapped and outlets are fenced for safety reasons. 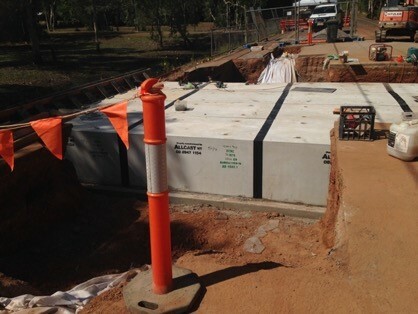 The suburb of The Narrows sits within the relatively large but heavily developed Ludmilla Creek catchment and has experienced flooding frequently since 1990.
building a staged detention basin and upgrading stormwater drainage on RAAF Base Darwin (see image above). Stage one of the open drain in Ludmilla Creek was re-established in 2015, however the second stage is awaiting environmental clearances due to the discovery of PFAS chemicals in 2016. There are significant issues with drainage in the Yarrawonga industrial areas, with flooding occurring even in relatively small rainfall events. The Department of Infrastructure, Planning and Logistics is delivering flood mitigation measures to alleviate the impact of localised flooding in Yarrawonga. The City of Palmerston upgraded stormwater drainage on the eastern side of Yarrawonga near McKenzie Place and upgraded Yarrawonga Road and Wallaby Holtze Road culverts (see image above) in 2017. The Department of Infrastructure, Planning and Logistics will upgrade stormwater drainage on Tulagi Road, which is expected to commence in the later half of 2018. Stormwater drainage is expected to be upgraded in the western area of the industrial estate, near McKenzie Place, in late 2018. Flooding occurs around Wadham Lagoon in Howard Springs and along the trunk drain to the Howard River, with a number of private properties affected. Following extensive flood modelling, stage one of the flood mitigation measures was completed in 2017 with new culverts installed underneath Whitewood Road (see image above). Stage two of the project to upgrade the existing trunk drain between Whitewood Road and the Howard Springs Forestry Reserve outfall is in the final design phase with works expected to be completed by the end of 2018. The Wadham Lagoon flood mitigation project will increase the stormwater capacity to cater for flood events, while future developments in the Howard Springs activity centre will still need to manage stormwater to pre-development flows. The town of Katherine has experienced significant flooding in the past, including in 1931, 1940, 1957, 1998 and 2006. The Katherine catchment is complex, with the actual impact of flooding dependent on the volume and duration of a rainfall event as well as which parts of the catchment the rainfall event takes place. The Katherine Regional Flood Mitigation Report recommended several structural mitigation options and whole of town resilience measures. This project update provides residents and stakeholders with the latest information on the flood mitigation measures being delivered by the Northern Territory Government. 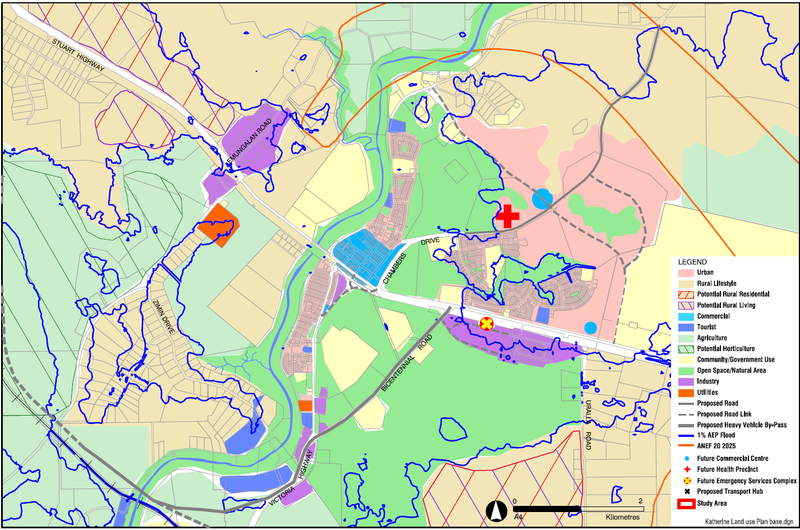 The Katherine Land Use Plan was amended in 2016 to include a neighbourhood commercial centre in Katherine East which provides for immediate, smaller scale flood free commercial land. This neighbourhood commercial centre in Katherine East is off the Stuart Highway, adjacent to the Katherine Research Station. It is proposed this site could include a full-line supermarket and speciality retail and/or household goods stores. The surrounding area could also potentially include community purpose uses, including aged care. The Department is currently undertaking planning towards the Katherine East Residential Area Plan including the Katherine East Neighbourhood Centre. The Katherine Ambulance Centre (see image above) was relocated from Kintore Street, which was prone to flooding, to Chardon Street in a flood free zone and officially opened in July 2017. The new centre provides workspace for disaster management personnel as a back-up to Darwin and provides overflow disaster patient care facilities. Digital flood modelling to test structural mitigation measures in the Katherine River catchment is underway. WRM Water and Environment has been engaged to assess the potential mitigation options that are most effective to mitigate flooding, recognising that in a large Q100 flood, there is limited options available due to the extent and severity of such a flood. Feasible options include levees which could reduce the flooding impact to properties in the smaller but more frequent flood events up to a Q20 flood. WRM is expected to finalise the flood modelling options by July 2018 prior to a concept design being developed for the preferred option. As part of this process the Department is obtaining survey of floor levels for all habitable buildings impacted by flooding, to provide detailed assessment of the effectiveness of the mitigation measures. Earl James Associates has been contracted to undertake this survey work. Stage one was undertaken in March 2018, with most of the survey data being captured with laser technology. It is anticipated that the remaining survey work will commence in June 2018 and some residents can expect to get notification requesting access to properties to survey habitable building floor levels, where laser data capture technology cannot be used. A Katherine River Corridor Weed Management Plan has been developed in consultation with the Katherine Town Council and the Department of Environment and Natural Resources Weed Management Branch. The plan has been created to target woody weeds, such as Neem (pictured above) within the Katherine River corridor and improve the river flow to minimise the impact of smaller flood events. A contract to start the weed management has been awarded, and control works will commence within the next few weeks. The first year of the weed control program will target weeds in high value areas such as Knotts Crossing, Low-level Bridge and Katherine Hot Springs, as well as isolated weed incursions that are easier to eradicate. Other weeds being targeted include Chinese Apple, Ornamental Rubber Vine, Devils Claw, Parkinsonia and Bellyache Bush. For further information, read the Katherine Weed Management Plan (8.2 mb). updating flood brochures on what to do in the event of a flood. Find out more with Growing the Territory. The Northern Territory Government is committed to assisting residents and properties in flood-prone areas through a range of flood mitigation options recommended by the Alice Springs Region Flood Mitigation Advisory Committee. Recommendations range from improvements in flood modelling and mapping to structural mitigation works for flood prone areas in the Alice Springs region, and improvements to policy. Much of the town of Alice Springs is located on the floodplains of the Todd and Charles rivers and residents and businesses experience riverine flooding when heavy rainfall causes the Todd River to flow and overtop its banks. There have been three major flooding events recorded since 1983 including in 1984, 1988 and 2000. Localised flooding can also occur as a result of overflows from stormwater drainage systems. Detailed topographic data has been obtained for the upper catchment of the Todd River to investigate the potential mitigation options to reduce the peak flow of a flood. This data will inform the potential location and effectiveness of infrastructure such as detention basin/s to minimise the impact of flooding in the Alice Springs region. To assist flood mitigation in Alice Springs, Budget 2018 includes funding in 2018/19 of $500,000 for digital modelling and $500,000 in 2019/20 to design the best flood mitigation solution for the Central Australian region. A further $10 million has been included in the 10 year infrastructure plan for construction of structural mitigation measures following the outcomes of the digital and design process. Two stages of community consultation have identified a preferred option to build a connector road to improve connectivity for the Mount Johns Valley and Desert Springs areas of Alice Springs. Currently, when the Todd River floods residents and businesses in these areas are unable to access the Alice Springs CBD or Stuart Highway and the only access is through a private service road. The Sadadeen Connector Road is listed in the 10 year infrastructure plan as a longer term priority. Engineering concept designs for the duplication of the Stuart Highway through Heavitree Gap is being considered as part of a planning study, in consultation with the Alice Springs community. This planning study is guided by the objective of no further constriction of the Todd River.